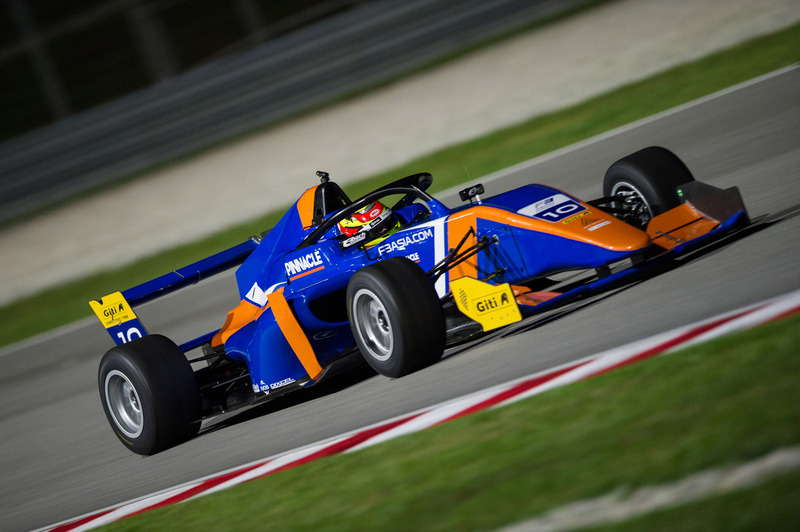 Rising New Zealand single-seater racing star Liam Lawson made an emphatic debut in Asia, totally dominating the final round of the Formula 3 championship at Sepang. Lawson made a clean sweep of all three races, top in both qualifying sessions, recorded the fastest lap in all races and led every single racing lap of the weekend. A late entry by Pinnacle Motorsport, Lawson headed to Malaysia only 48-hours after getting the call up by the Irish team. Once they overcame electrical issues that dogged the car in all three practice sessions, the 16-year-old Kiwi was never headed and delivered the team their maiden Asian F3 victory. “Everything worked out perfectly. Pinnacle gave me a fantastic car and I’m really happy I was able to drive it to three victories. They’re a fantastic team, the car’s fast and this shows what they’ve been capable of all season,” said Lawson. Asia is the first region in the world to use this new halo-equipped F3 car and racing at Sepang has allowed Lawson the opportunity to drive it ahead of its introduction to Europe next year. So how did he find racing a car fitted with the new halo? The new halo protection bars are slowly being introduced over all the FIA-sanctioned racing categories. The biggest battle Lawson faced all weekend wasn’t on the track but competing in the heat and humidity, conditions he’d never experienced before. “That was the most physically demanding racing I’ve ever done, in terms of heat. It was just so hot. But what a great opportunity it’s been to experience driving here in Asia. Lawson’s biggest winning margin of the weekend came in Race 2 when he beat well regarded French driver Ye Yifei home by just over 22-seconds. That followed an 8.7-seconds victory over Japan’s Tomoki Takahashi in Race 1. The final race was halted after just a few laps when a monsoon hit the circuit. Eventually restarted after a lengthy delay and reduced to 10 laps with several Safety car interventions, Lawson won the final sprint from Takahashi, but slowed up to take the chequered flag and acknowledge his team cheering from the pitwall. Caption: Liam Lawson gave Pinnacle Motorsport a clean-sweep of all F3 three races at Sepang. Top 3 – Sepang, Malaysia.